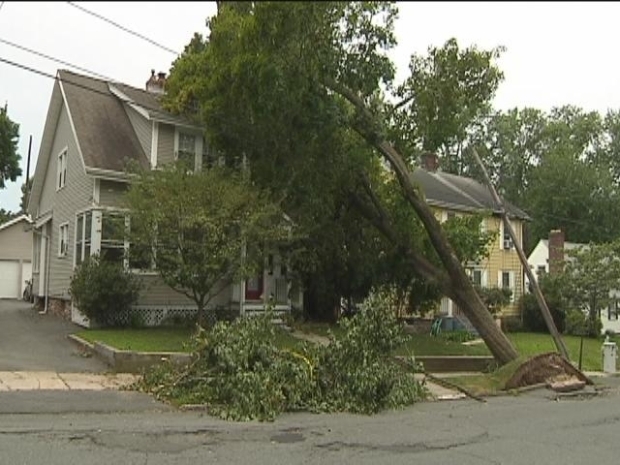 Now that National Weather Service officials confirmed that tornadoes touched down in Litchfield, Thomaston, Bristol and the Terryville section of Plymouth during Wednesday's storms, the cleanups are beginning. It will take days and, in some cases, weeks to recover from the EF-1 twister that brought winds up to 100 miles per hour. Renee Doran is staying with family after a tree did significant damage to her house. She was trying to close her door on Wednesday when a tree crashed through her window. She retreated to the basement with her children. Now, they are waiting for the tree to be removed and for the electricity to return. Brynn Gingras reports on the cleanup effort after a tornado rips thru the state. The twister tore through four towns in about 40 minutes, causing damage to yards and blocking roads. “There's trees like this just huge, and the wind was just tossing them around like rag dolls, it was incredible. And I would say for about 20 minutes, it didn't just hail, it poured hail,” Gerry Farrel, of East Litchfield, said. Companies are cutting trees and many people are trying to remove live wires scattered across their property. “It's going to take an awful long time to do that, but at least nobody got hurt, which is the main thing you know,” Diane Sanford, of Thomaston, said.